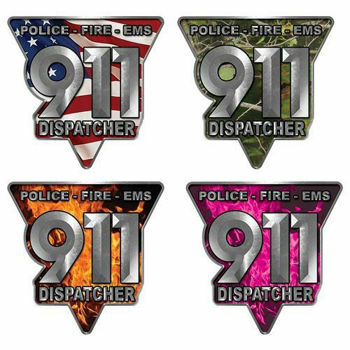 911 Emergency Dispatcher Police EMS Fire Decal from Weston Ink. Dispatchers are a extremely important part of our emergency management system. We created this graphic just for them to be recognized for the stressful work that they do. Our new 7 Color translucent ink process makes all of the color of this graphic reflect with the reflective option and we now offer this graphic in a special canvas like interior wall decal. Along with these we have face decals, arcs, markers and tetrahedrons to match for your helmet. If you want to go further check out our reflective lettering and numbering to add an additional personal touch to each one. We also have Custom Options to add any text you would like.